When a farm business is created in Cash Manager Focus the income and expense alignment to your chart of accounts is ready for you to map. The Type within each category and extended code determines how it is aligned to your chart of accounts. 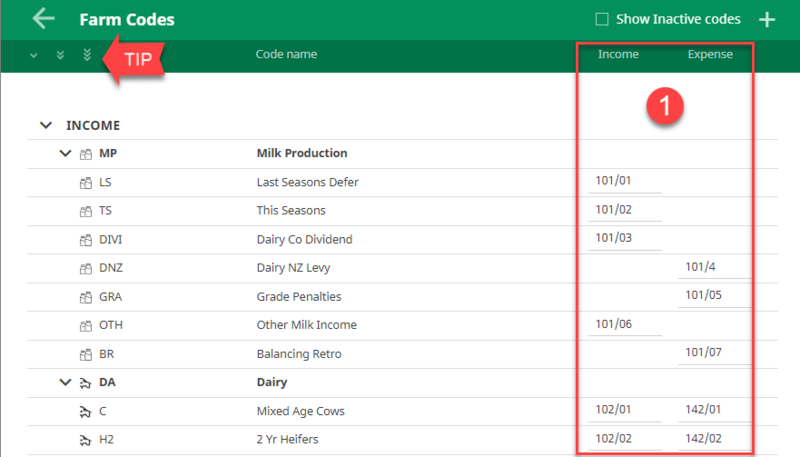 For example, livestock codes have the code Type ‘Stock’ so they will have both an Income and an Expense field to map. If you need to alter this you can do so by editing the code. Enter your codes into the Income and/or Expense columns, against the corresponding Cash Manager codes. These can be mapped in the General Ledger Account Codes screen found in Settings - Codes -General ledger account codes.